FROM THE EAST retraces a journey from the end of summer to deepest winter, from East Germany, across Poland and the Baltics, to Moscow. 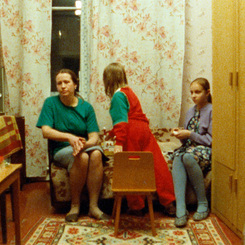 It is a voyage Chantal Akerman wanted to make shortly after the collapse of the Soviet bloc "before it was too late," reconstructing her impressions in the manner of a documentary on the border of fiction. By filming "everything that touched me," Akerman sifts through and fixes upon sounds and images as she follows the thread of this subjective crossing. Without dialogue or commentary, FROM THE EAST is a cinematographic elegy.